Hobby Hardwood Alabama is a full time, small, friendly, family owned lumber operation specializing in producing furniture grade lumber located in New Market, Alabama, just north of Huntsville. We sell a variety of high quality kiln dried and planed hardwood lumber sawn from trees harvested locally in North Alabama and Southern Tennessee. We sell to hobbyists, craftsmen and professional woodworkers who want great wood for a great price. Serving New Market, Huntsville, Alabama, Tennessee and surrounding areas. Come on by, take a look and you'll see some wood that will make your eyes light up. We try to make buying top quality hardwood an enjoyable and stress free experience, and take pride in having a clean, neighborly place for you to check out our lumber. 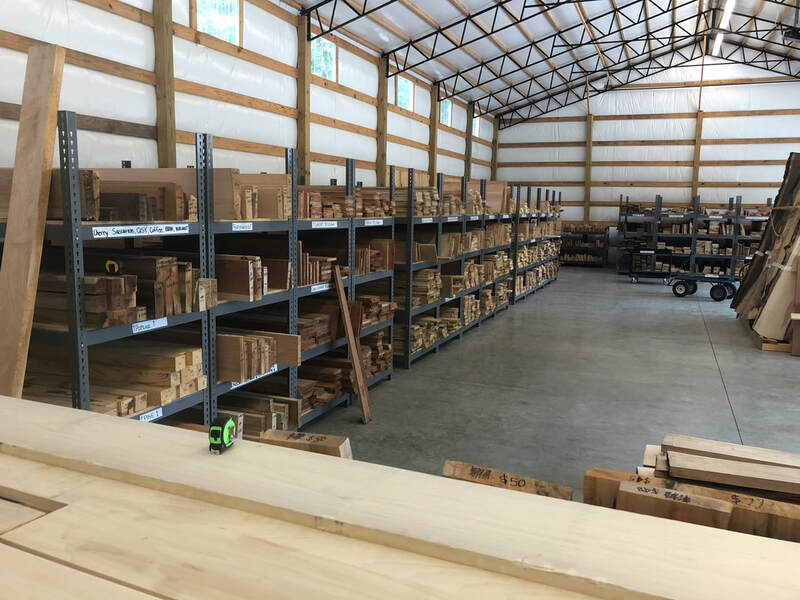 Take a look our "Lumber for Sale" link at the top of page, to see what we currently have for sale. Most of the lumber will be nearly a full inch thick, but we also have some two inch thick boards and high quality live edge slabs. I am a woodworker, cabinet maker, former house builder and furniture maker and have lived in the Huntsville area for nearly 40 years. I used to spend more time looking for quality hardwood lumber than I did building my cabinets, furniture and other woodworking projects and when I found some, it was low quality, incredibly overpriced, air dried, or turned into potato chips by someone else's attempt at milling or kiln drying. So we took the bull by the horns and started a small sawmill and lumber kiln operation years ago to provide high grade furniture lumber for ourselves. Soon word got around, other folks liked working with our lumber, our business grew little by little, and now we use our sawmill, kilns and connections to provide top quality hardwood to hobbyists and professional wood workers alike in Huntsville, Alabama and surrounding states. Our customers range from hobbyists, homeowners, carpenters, cabinet and furniture makers, professional musical instrument makers, wood carvers, to folks who just want to build a doghouse or front porch bench. We put a lot of effort into providing top quality hardwood lumber and are very proud of the wood we sell. I won't sell a board that I wouldn't use myself. 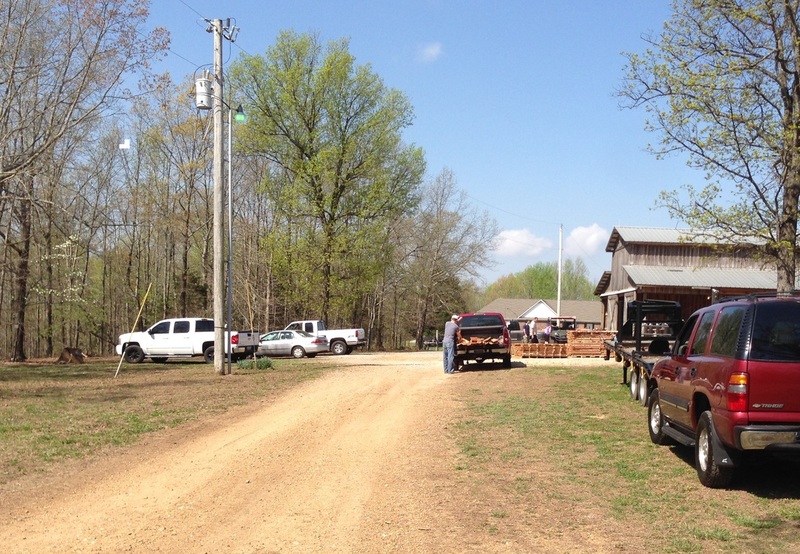 People sometimes ask if we deal in exotics, I tell them "Yes, North Alabama exotics!" The reason I say this is that most people never get a chance to see the beautiful and amazing species of wood available in this area. Who needs hardwood from overseas when our native wood is as pretty and unique? ﻿﻿Lumber Grade - We take pride in producing boards that are of the highest grade, anywhere. Typically, the top grade in the industry as defined by the National Hardwood Lumber Association (NHLA) is called FAS grade, (Face and Select), and if you go to any wholesaler in the country, and ask for the best grade, thats what you'll get. The problem is that FAS is required to only have 83% usable wood per board, which means up to 17% of every board is destined for the garbage can. So thats why when you buy wood elsewhere, sometimes you'll note knots, cracks, bark, and other defects and although you don't want to pay for it, you do. We are not like that. We want to take boards to the next level and our top grade is one grade higher than the FAS grade. Around here, it is called the HHA grade, and we try to make it 100% usable yield. We have our own local grade stamp, and when we deal with other business, our boards are graded with an "H" for "Highest" or "Hobby Hardwood". Typically, our common grades, or lower grades, of wood is actually the industry's top grade. So our No. 1 Common is actually the industry FAS grade. ﻿﻿Logs - Much of our lumber comes from logs off our farm, from professional loggers, top quality sawmills and log brokers. 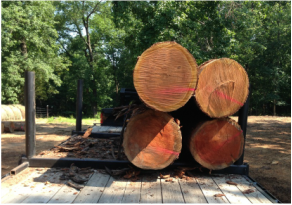 We know that great lumber only comes from premium logs, and we spend a considerable amount of time and effort tracking down the best ones in north Alabama and southern Tennessee. Its not easy finding these, and sometime our stock of lumber runs low, but we won't compromise and buy low quality logs and try to pawn them off as the good stuff. Log Trimming and Sealing - We inspect and trim the ends of every single log to ensure we have the best quality sections to work with. Then we end seal the logs with a product specifically formulated to prevent logs and lumber from end splitting. This ensures that our logs don't degrade in our log yard and make it to our sawmill in the best shape possible. Milling - Although we expend a lot of effort finding the best quality logs, we take it to the next level sawing them correctly. We use specialized milling techniques called grade sawing and parallel bark sawing to get the highest possible grade and yield from the logs. I am a registered Pro Sawyer with Wood-Mizer and was in an article in their 30th Anniversary Magazine. Without a doubt, there is a lot more to sawing lumber than hacking at a log like its a piece of cheese! We use our own professional blade sharpening and setting equipment to insure our blades are in top condition, and the sawmill is dialed in and cutting laser straight. We also work with other local, high quality sawmills to get the best boards in the area, and each and every board is hand inspected by us, and must meet our very high standards. We have a 20 hp 3 phase, twin laser, two sided blade edger, custom made for us by Baker Sawmill Products. Its a state of the art, hydraulically driven machine that cuts the rough edges off boards as quick as they can be fed into the conveyor. Its a very specialized piece of equipment that we believe adds an extra bit of quality to our boards. Kiln Drying and Sterilization - We have three kilns that we use to carefully dry and sterilize all our wood to 7% - 8% moisture content and then hold at 150 degrees for 24 hours to kill any possible insects or mold. The sterilization ensures that you are not going to build a piece of beautiful furniture only to look under it one day and see a small pile of sawdust under it where the bugs have been chewing. We consider sterilization a critical step, and will not sell a piece of kiln dried wood that has not undergone the process, its just too risky. Running a dedicated sterilization cycle is not usually done by other dehumidification kiln operators as it takes extra time, usually 3 days, and electricity. Just because wood has been kiln dried does not mean it is sterilized, as most DH kiln cycles top out at 120 degrees, not high enough to properly sterilize. It takes special effort, time and expense to do so. If you purchase wood form other sources, ask them if they perform a dedicated sterilization step. Most likely they will give you a "What?" look. Air dried wood is not sterilized, no matter how long it has been drying, and since the incubation period for certain insects can take years, not seeing bugs when you buy air dried wood doesn't mean they aren't in there. 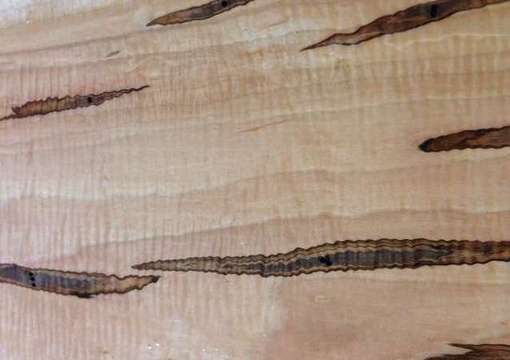 As an interesting observation, I have never kiln dried and sterilized live edge slabs where there weren't dead bugs on the wood when the cycle was finished. Never. Live edge slabs will always have bugs under the bark or in the cambium layer. The only way to kill them is with heat, and we sterilize every single load of wood that comes out of our kilns. Surfacing and Planing - Our lumber is not rough sawn, instead its "skip" planed, both sides, to 15/16 inch. We take the extra step to run all our wood through a planer. This is a time consuming and laborious step, but cleans up 90% to 100% of both surfaces of the boards, and brings everything to a consistent thickness allowing us to inspect and grade each and every board. From a customer standpoint, this has several benefits. Buying nearly 1 inch thick planed lumber allows building a greater variety of projects than standard 3/4 inch lumber. Many woodworkers have very effective but light duty planers that can's take big bites, but work very well to further plane to 3/4 if desired. Additionally, have you ever spent good money on rough sawn lumber, planed it at home, then discovered the wood wasn't as high a quality as you thought, with unexpected knots, sticker stain, or other defects? Maybe you couldn't even get a real board out of it, because the defects wouldn't plane out, or it was too thin? I've had this frustrating experience happen to me when I bought rough sawn lumber from other sawmills, so I make sure it doesn't happen to you. With us, you get to see exactly what you are buying, no surprises. We have an in-house Powermatic commercial duty planer, and can further plane your boards down to 3/4 inch if you want, while you wait. Since planing is very time consuming and I'd rather be sawing wood, we sometimes load packs of our wood on a trailer and take it to a local shop where they have a monster double sided Pinheiro planer. We are very serious about making sure you get top quality boards. Straight Line Ripping - Not all sawmill lumber comes out straight, and we understand that. However, we also understand that people want to buy straight boards, with no bark, wane or other issues. So we inspect every board and identify the ones that aren't good enough and run them through our commercial Straight Line Rip saw. A SLR is a very specialized piece of equipment, and only does one thing, and that is put a clean, straight edge on a board. This machine, since it doesn't need a fence, but uses a laser to mark the cut line, allows us to surgically edge out things like knots or cracks, so you don't have to do it yourself. Most of our boards are run through the SLR, and it results in a board with less waste for the customer, and a lot less work as its sometimes difficult to get a truly straight edge on a long board with a table saw. As far as I know, we are the only local sawmill who have invested in a SLR and take the extra effort and time to do this. Face Jointing - We have a 12 inch commercial duty long bed jointer and use it to face joint any board that has significant bow, cup twist or warp. This is a very labor intensive step, and we inspect and clean up any board before it goes on the shelves. We face joint thousands of boards and use a power feed to speed the process, but we also do quite a bit of it by hand. This is a step that we believe is critical, as nobody wants to buy a warped board. This is another step that separates us from other sawmills. Hidden Gold - One of the fun things for me about trying to get the very best logs and lumber is hunting for it. We mill the majority logs we use for lumber onsite with our sawmill, but I'm always on the look out for the next batch of "hidden gold" boards from other local sawmills. Since we have some of the best hardwood trees in the area, and I know other people in the trade, sometimes they get into some logs or lumber that I just have to have. So I'll work a deal, and we'll get it. Then we run it though our inspection and trimming processes, and make it even better, and bring it up to our very high standards. My colleagues and friends jokingly say there are two different lumber grading standards; the first is the NHLA (National Hardwood Lumber Association) grading standard that everybody in the industry knows and works to, and then, even a level above that, is the HHA (Hobby Hardwood Alabama) grading standard. We take a lot of pride in that, knowing that professional people in the trade say that we have the "good stuff!" It's not unusual for customers to tell us that they were referred to us by other wood supply stores, sometimes a hundred or more miles away, ones we've never even talked to, because we had such special and high quality wood. Our Commitment - We want to provide the best lumber, at the best prices, with the best customer experience. We do our best to cater to everyone who has an interest in fine wood, to keep things relaxed and easy going, and are proud to say that we have a lot of women and young people as repeat customers. We are a little out of the beaten path in the beautiful hills of New Market, but most folks don't mind the view when they get here. Woodworking is supposed to be fun, but it’s not if you have to spend a big pile of bucks to buy a few boards that you can carry out of the retail store tucked under one arm. Depending on the grade of lumber you want, I can fill up your pickup truck for the same amount of money. The End Product - First Class Lumber! In the end, what do you get out of it? What are we trying to sell you? First class lumber that fits your needs! Looks at the pictures below, and try to imagine how good you would feel building projects from wood like this. When is the last time you've seen 17 inch wide oak or cherry boards? Without a knot? Kiln dried? Flat as a pancake? Or when was the last time you and your kids could share a woodworking project without having to worry about missing a cut because the wood you bought retail was so expensive? Some of my mill run project wood is so inexpensive you can just have fun and not worry about it. Operating Hours - Saturdays From 9 am to 4 pm Or By Appointment. Although we operate full time, we are typically only open to retail walk-in sales on Saturdays, from 9 am to 4 pm or by appointment during the week. We have four people working on Saturdays, we shut the machines off, open the gates, and our only job is to help the customers get exactly what they want. We can give tours, answer questions, and just be available as needed. We already have each board marked with its species, width, length, and board footage, in order to make it easier for folks to estimate how much they need for their projects. We try to make things flow smoothly, and want customers to have an enjoyable experience. The most common reactions we have from new customers is "Wow" and "I've never seen this kind of wood before", which is exactly what we want. We have a wide diversity of customers, many are expert woodworkers and are glad to help with some sage advice if asked. Come on by, take a look around, and pick out some wood to make your next masterpiece. Here are a few that our customers have built. One of our regulars, Jim P, sitting in a beautiful cedar bench he built, relaxing and enjoying the day.